The Grabber attracts flatware, cans, bottles, cups, pens, paper clips and other ferrous metal items from the waste stream flow zone. 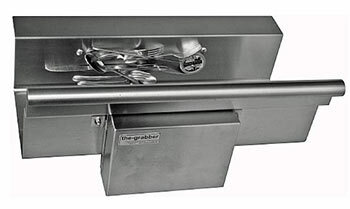 The powerful patented focused grabber magnetic system is specifically engineered to grab ferrous metal objects and hold them out of the waste flow as it travels down the trough to the pulper or garbage disposal system. The metal objects remain within convenient reach of the scrapping operation for easy removal. Operators are able to work faster knowing the Grabber will grab and hold any flatware of other ferrous metal they may have missed. Saves costs by eliminating damaged and destroyed flatware. Payback is typically less than one year, frequently only a few weeks. No operating, service or maintenance costs. Very easy to install on a new or existing retrofit project location. Reduces pulper and garbage disposal jams, replacements and repairs. Permanent magnet with a 100 year half-life.